If the weeks of teaser images and videos weren’t a big enough clue, walking into Club BRP and seeing bleachers set up facing a stage and a mini dirt track was a clear indication something big was about to happen. On the evening of Tuesday, Aug. 16, BRP unveiled its latest sport side-by-side, the Maverick X3, along with the 2017 Sea-Doo lineup and a Spyder F3 Limited. It was a presentation focused on new product — dropping from the ceiling and rolling onto the inside dirt track — rather than reports on numbers and business performance. Those subjects were addressed during meetings later in the week. 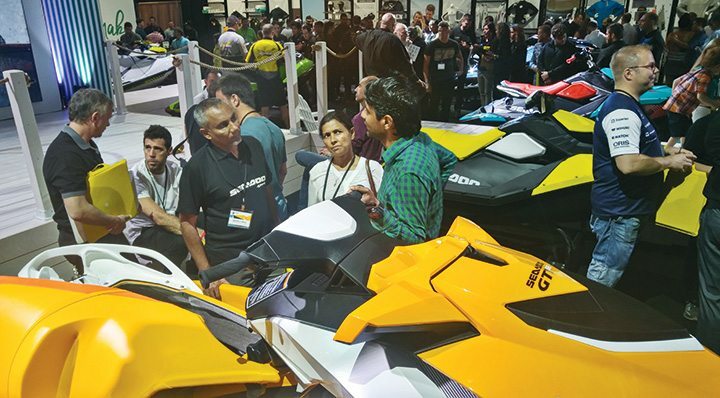 More than 2,300 people, including dealers from the U.S. and across the world, select media and BRP staff, trekked from the Hyatt Regency Orlando to the Orange County Convention Center next door to see the latest from BRP’s Can-Am and Sea-Doo brands, and the reception was positive. Can-Am’s latest off-road model was sure to be the highlight, as the brand began releasing teasers on July 28 and continued sharing teaser photos and video up until the unveil. The 154 hp, turbocharged X3 with a 102-inch wheelbase and up to 24 inches of suspension was immediately a hit among dealers. A couple dealers pose for a photo inside a Maverick X3 at Club BRP in Orlando. Two X3s were driven from backstage to pass each other in front of the stage before each sitting atop their own dirt platforms flanking the stage. Trophy truck racer BJ Baldwin and rally car driver Ken Block then described their experiences riding the side-by-side in the desert. 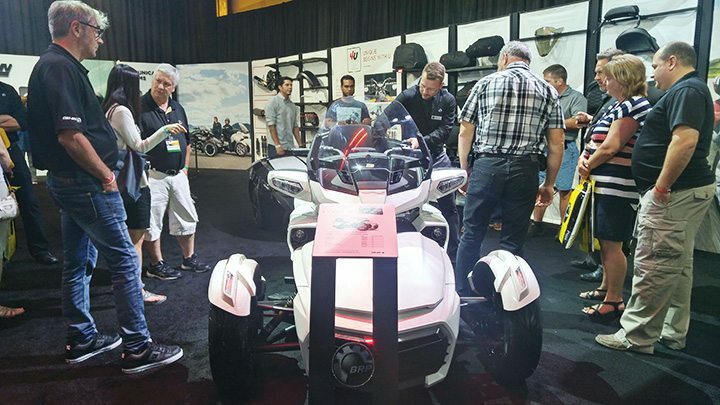 As soon as the presentation was over, dealers clamored to the units in front of them, as well as those in the Club BRP showroom to get a better look. Can-Am then set up a live video reveal on Facebook, shot from the showroom. The video has earned 72,000 views and nearly 1,000 comments. 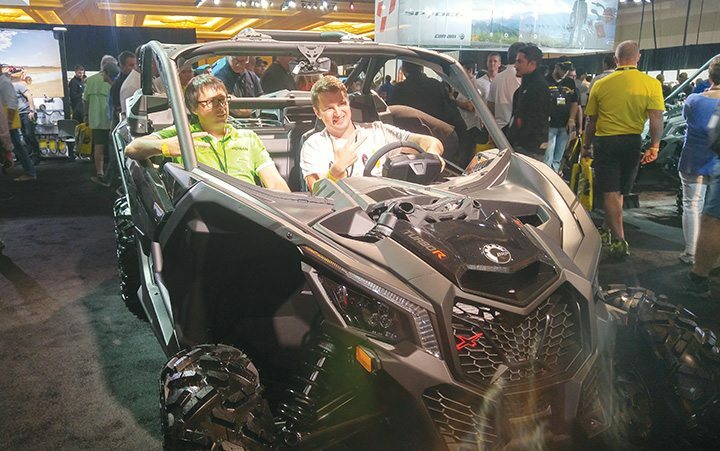 Boisjoli describes the Maverick X3 and the Defender, released in 2015, as Can-Am’s second generation of side-by-sides, following the release of the first generation Commander and the original Maverick, which were unveiled in 2010 and 2012, respectively. “We designed from a white piece of paper, a brand-new sport side-by-side, and the results are, I would say, outstanding,” he told Powersports Business. BRP relied on its experience in developing high-performance snowmobiles, ATVs and watercraft when creating this new flagship for the side-by-side line. “The high end, the sport unit, is always building the halo over the brand. And for us, now the Can-Am X3 is, I believe, the best sport side-by-side on the market. It’s raising the image of the overall Can-Am brand, which is very beneficial,” Boisjoli said. Dealers appeared to be equally excited, as trying to get near an X3 in the showroom immediately following the unveil was nearly impossible, and conversations overheard throughout the showroom were enthusiastic. “My first reaction: amazing! It looks awesome and rides awesome,” reported Eric Osner, president of Crossroad Powersports in Upper Darby, Pennsylvania. With orders coming into the dealership as soon as he returned from Orlando, Osner was positive the X3 will be a good seller in his area. Chris Watts, vice president of America’s Motor Sports, with three locations in Tennessee, also received deposits in the first week after the X3 was unveiled. “I was excited to see BRP come out with a machine that surpasses the competition, not just catch up to it,” he said. Wade Rice, owner of Rice Honda Suzuki in Rapid City, South Dakota, was impressed with the seating position, the motor platform and the shocks. “The 64-inch is going to sell better in South Dakota because the trail systems are narrower, so at least when they take the same 64 to the dunes, they’ve still got all the horsepower they need,” he said. The side-by-side comes in three configurations: the 64-inch-wide Maverick X3 and Maverick X3 X ds, and the 72-inch-wide Maverick X3 X rs. Though the Maverick X3 was the star of the night, the first vehicle to drop from the ceiling at the Orange County Convention Center was the Sea-Doo Spark Trixx. Designed specifically for novices to perform tricks on the water, the Spark Trixx offers a Variable Trim System (VTS), handlebars with an adjustable riser and step wedges. Clearly targeted at the millennial market, the Spark Trixx was another can’t-miss in the Club BRP showroom. A stand held a unit upright in a mock tail-stand with a mannequin on board to demonstrate the Trixx’s abilities. Sea-Doo unveiled the Spark Trixx as well as updates to other models. Dealers were also happy to hear the price on the recreation GTI and GTS models has been lowered for 2017. The GTS now starts at $7,699, while the 2017 GTI has an $8,899 starting MSRP. Both models also had their engines swapped out for the 900 ACE HO and dropped 150 pounds by adding the Polytec hull. Another dealer from Texas said with two large lakes nearby, he’ll sell more Sparks with the Trixx in the lineup, but the GTI, which is a top seller in his area, should also move well with the lower price. With Spyder not as focused on fall releases, the brand only showed one new model. The F3 Limited is designed for 2-Up touring with a removable top case with integrated passenger backrest, as well as automatic self-adjusting air suspension, heated grips and footboards and a six-speaker audio system. The top case allows riders to store two full-face helmets inside. In addition, Spyder lowered the price on its 2017 F3, dropping it to $16,999, almost 15 percent lower than the 2016 model. And the Spyder RT Limited added a Garmin Zumo 590 GPS and two new color options — Champagne Metallic and Asphalt Grey Metallic. Rice was glad to see these updates, as the Spyder is a good seller in Rapid City. “Spyder is a really good product for us, with the power steering. A lot of people ageing out of motorcycles are needing to go to something; Spyder gives them a model they can just step into,” he said. Spyder showcased its new F3 Limited in the Club BRP showroom. Boisjoli said the launch of so many new and innovative products that fall on the heels of the Ski-Doo REV platform, the Commander, the Spyder and the Spark, shows that BRP is constantly looking to improve its vehicles. 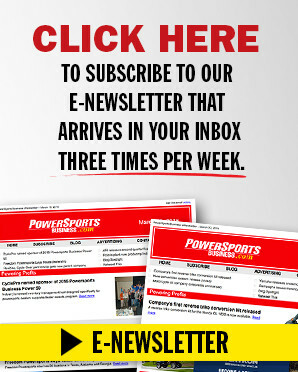 “The mindset we have at BRP is always renew our product, always innovate. Because we’ve proven it many times: If you come with the right product at the right time, it creates a lot of enthusiasts, and it’s very good for the business,” he said. 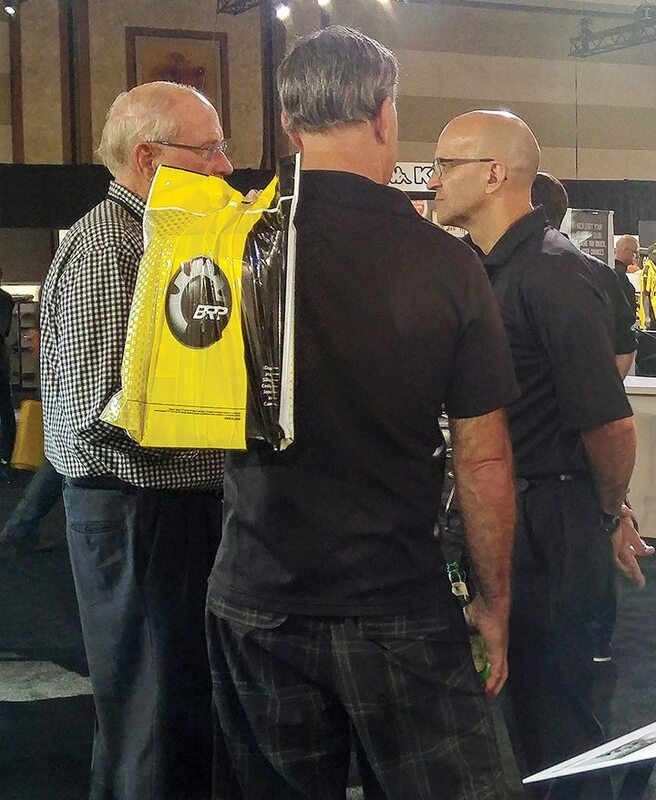 BRP president and CEO José Boisjoli, right, talks to dealers in the Club BRP showroom at the Hyatt Regency in Orlando. As he walked through the showroom the night of the unveil and talked to dealers throughout the club event, he was energized by their enthusiasm for the latest products. “BRP right now, we are in the good business period. All of our products are extremely competitive. We’re gaining momentum everywhere. We have signed many dealers in North America in the last three years, and there is a real positive momentum right now with BRP, and you could feel that emotion, the inertia at the club,” he said. That positive feeling followed him to the airport and home to Valcourt, Québec.